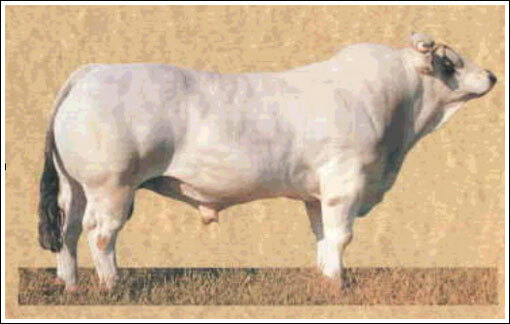 The Marchigiana has a number of excellent qualities essential to the beef production industry. This breed has practically no birthing problems. In general 99% of the cows calve needing no help, only 0,35% needs assistance. And only 0,05% of these are cesarian sections. These figures are based on research involving 32.000 cows. The calves are long and thin at birth and weigh between 32 and 45 kg. As there are practically no problems with calving the Marchigiana are an excellent species to breed in wide open spaces as there is no need to keep cows about to give birth in or near stables. The same goes for cross breeds or surrogates carrying embryo’s. When the calves are born they are immediately full of life. They are normally standing after 20 minutes and sucking within half an hour. The inert calves are drinking within the hour. This means they receive the all important colostrum very quickly after birth, making them more disease resistant. This breed has an excellent fertility rate. The cows can calve every year. Even with artificial insemination they calve yearly. These animals were selected on their character and used as a working animal upto 40 years ago. They are a very accommodating breed. This also means one can easily approach the cow immediately after calving. This accommodating nature is passed on when crossbreeding. The animals are well manageable even in wide open spaces. As these animals have been used as working animals they have very strong legs. The legs aren't crude but very hard. Much attention has been given to the position of the legs over the years. This means that walking great distances to get enough food is no problem. The quality of the Marchigiana beef can be rated as excellent. The meat is very tender and lean. It is very tasty as the meat is well-marbled and it is low in cholesterol. De Marchigiana’s grow very fast. In Italy and the Netherlands the average growth is about 1.650 grams a day. We keep animals in Zimbabwe in the same manner as the local animals, meaning they have to find their own food. These animals gain 1.300 grams a day. This gain is achieved without special feed. These animals live long in general.15 year old cows who calve every year are not exceptional. There are even quite a few cows of almost 20 still calving every year. Testing the animals body temperature in different climates has been done in several countries. They found an extremely marginal change in the body temperature between - 15 upto 40 degrees Celcius. Even more important is the pigmented skin. Their hair coat is white but their skin is black. This ensures their resistance to solar radiation, something other breeds lack. The nose and eyes are also black. This breed can be found in several countries around the world. Native livestock is crossbred with the Marchigiana at a large scale with an excellent result. Therefor the need for little bulls is growing in these countries.